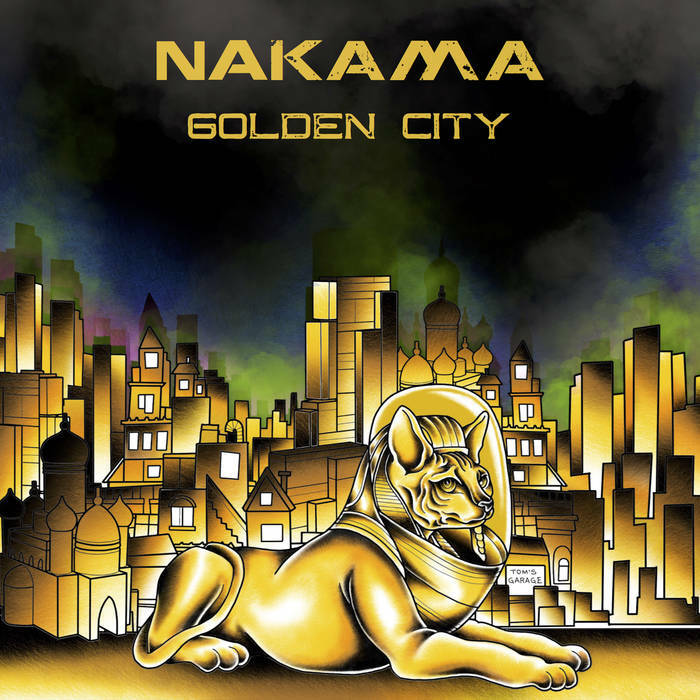 Nakama, formerly known as The Space Cats, the recently re-named progressive instrumental rock-improv quartet in Philadelphia recently released their latest work, Golden City, mixed and produced by Ben McGuinn. Name change or not, these four cats have been in the lab at work, and you can tell. Title and leading track, Golden City, opens to an improvisational soundscape with Ian Mayer skillfully traversing the frets with arpeggios and riffs into a strong, triumphant close. Mayer brings the shred factor to Nakama, this is clear. Dancing notes from keyboardist Adam Nash open track 2, Bastet, joined in by drummer Sal Galati and David Rosen on bass guitar in unison...and then Ian Mayer shows up again, hurling metal flying at you like he came out of the smoke with a chainsaw in his hand. On keys, Nash masterfully fills in space and time with wailing synth notes which finally come to a simmer to help guide the track to silence. Waves of Bliss, a more delicate piece by David Rosen on the low end, has a certain bouncy wave-like step to it, as he and Nash weave in and out with Galati holding the center line beats. Tom Says Tom, a personal favorite from their catalog, is the fourth track on Golden City which proudly showcases Nash on the keys taking us through a video game-like synth-scape, as he picks up speed and force with Rosen thumping sturdy bass lines at us. Swooping in for the last piece of the melody, Mayer volleys with some more explosive guitar licks. Closing out Golden City, and reminiscent of the furry creatures that once roamed these lands, Furra is the 5th and final track on Nakama's latest work. At first dark and stormy, the composition reveals itself to be laced with syncopated rhythms and hand-work from Nash and Mayer equally. Furra must be cat-speak for 'fireworks', for when combined with the thickly fluid bass line from Rosen and strong hands on the skins from Galati...It packs the punch, as they say. Our adventure ultimately and skillfully brings us back to a quiet chamber within the Golden City among the warm and furra. Check out a live version of Furra below from 5/25/17 at Bourbon & Branch. Recently performed at Connie's Ric Rac in South Philadelphia, Nakama is slated to play The Red Stallion Bar & Grill in Warminster, PA on 3/31 with special guests and then Manayunk's The Grape Room on 4/14. More dates to be announced.